Helke Seitz received a master’s degree from the Freie Universität Berlin in 2013. In her master thesis she analyzed the effect of informal elderly caregiving on female caregivers’ labour supply in Kyrgyzstan. 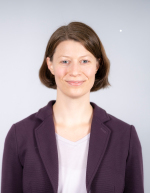 During her studies, Helke worked as a student assistant at the German Institute for Economic Research (Department of Public Economics and Development and Security), Freie Universität Berlin and as an intern at the Ifo Institute for Economic Research and the International Labour Organization in the Philippines. Her research interests are in the fields of labour and development economics with a focus on financial development.